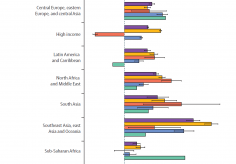 In recent years, global resources for improving health have grown rapidly in most countries. Now more than ever, objective, comparable, and comprehensive information on national and international financial resources from all of the different funding channels is necessary to make the best decisions about where to invest and to understand the kind of impact investments are making. In addition to this, disease-specific funding can be used to inform policy, identify gaps, and assess effectiveness and tradeoffs. While previous research on global health resource flows yielded important estimates and findings, ongoing research focuses on disease-specific spending, focusing on trends in donor financing and domestic spending. IHME’s Health Financing research tracks these different financial streams to estimate DAH from 1990 to the current year, along with disease-specific spending and future spending projections to assess the potential for gains in health service coverage and improved health outcomes. We also examine how public resources for domestic health spending relate to incoming development assistance from external sources, track out-of-pocket and prepaid private expenditures on health, and research the composition of resources that are relevant to policymaking. We examine whether the distribution of global health resources reflects current global health priorities by classifying resources according to their disease focus, the health system function that they attempt to strengthen, the type of input, and the target population. 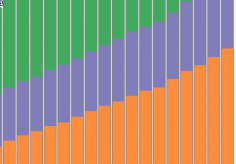 These results can be viewed using our Financing Global Health data visualization. 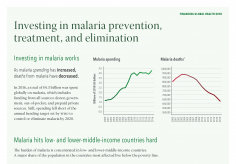 This 10th edition of the Institute for Health Metrics and Evaluation’s annual Financing Global Health report provides the most up-to-date estimates of development assistance for health, domestic spending on health, health spending on two key infectious diseases – malaria and HIV/AIDS – and future scenarios of health spending. Publications, from policy reports to research articles, covering the topic of health financing. 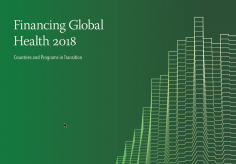 Read the latest news releases from IHME about published health financing research. See upcoming events that IHME will attend, host, or participate in concerning health financing. In 2016, a total of $4.3 billion was spent globally on malaria, which includes funding from all sources: donor, government, out-of-pocket, and prepaid private sources. 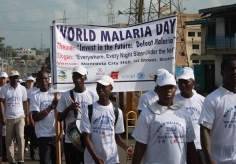 Still, spending fell short of the annual funding target set by WHO to control or eliminate malaria by 2020. 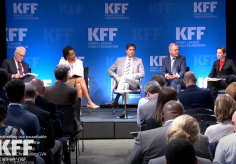 On Thursday, April 25, the Kaiser Family Foundation (KFF) and the Center for Strategic and International Studies (CSIS) Global Health Policy Center held a policy roundtable on the latest data on funding for global health, including from the US government. View the recording.